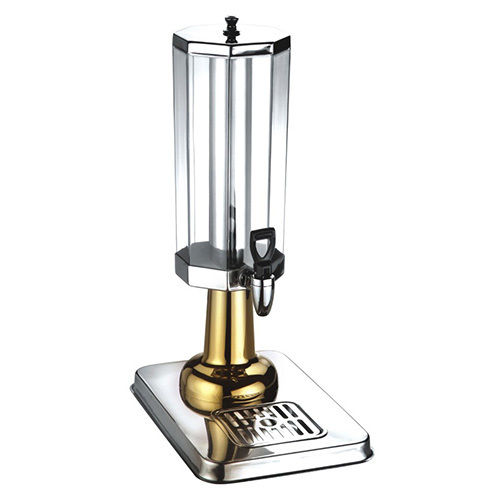 The cold beverage dispenser is an elegant way to enhance your beverage presentation. The removable beverage container and drip tray makes clean-up quick and easy. This cold beverage dispenser is perfect for all juices and chilled non-carbonated beverages. Also suitable for hotels, buffets, and upscale catering events. The base and cover are constructed from beautiful, mirror-finish stainless steel, while the clear polycarbonate beverage container gives a perfect view of what is inside. This beverage dispenser features a unique center ice core, which keeps the beverage cold without watering it down! To make sure your beverages remain ice-cold without being watered down, the clear beverage compartment includes a built in ice core. Just fill the core with ice, and your beverages will remain at the perfect temperature for hours. Each container is made from clear polycarbonate which minimizes the risk of breakage while maximizing beverage visibility. The flat lid is both visually appealing and features a knob on the top for staff to quickly and easily remove for refilling.